There were many ideas at the beginning of this trip about how much sharing and documenting I would do along the way. In the end the moments have been more interesting as fleeting. So that's how I've let them fly. Uncaged. Unleashed. Ill be home in just a few days. On Wednesday Aug 2 I have organized a river clean up and ride. You can learn more and sign up here. On Thursday Aug 3 I'll be playing a special release show in Minneapolis at Creation Audio. I'll be joined by Jeremy Ylvisaker, Mike Lewis and JT Bates who were the band for the recording. There are a limited number of tickets and you can get them here. Here are a few thoughts and pics from the last several hundred miles. Group ride at Point Sandy Beach with the folks from Broken Spoke in Greenbay. The lake was so high there was no beach to ride on so we took to the woods. The transition from dirt to pavement was challenging but I found other things to be amazed by. There is wildness everywhere and I now believe that the wildest of the wild are the weeds pushing up through the sidewalk. 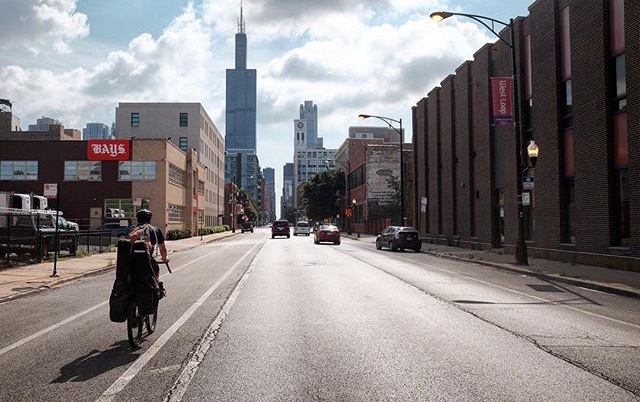 This pic was taken by my friend Bailey who hosted my Chicago show at his shop Comrade Cycles. Took the commuter train out of Chicago. Bike paths were flooded due to so much rain and I didn't want to backtrack or deal with endless sprawl. After so much heat and humidity it cooled off the day I was in Madison. Jeff at Revolution Cycles did a great job picking this performance spot out on picnic point. This was about the moment that the residue wore off. As one transforms one begins seeing more that needs transforming all around.